Today is the first day of FALL!! Can you even believe it? Since it was 104 degrees here yesterday I have to say it doesn’t really feel like it, but that doesn’t mean I’m going to celebrate! I actually decorated my mantel a while back, but of course never got around to photographing or posting about it. My favorite part of the whole thing is the incorporation of the metallics. I’ve been snapping up any shiny faux mercury glass pieces I can find (at thrift stores and discount stores etc) And I love this owl. I used him last year on my halloween mantel and he is back for another appearance, along with a silver pedestal candlestick. 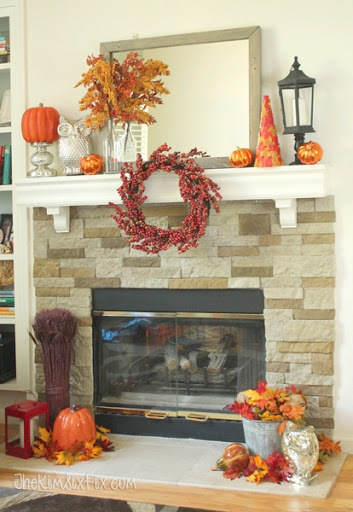 Because the mantel is shallow, instead of layering it in front of the mirror like I have typcially done in the past (here, here, here, here) I put it on the front of the mantel shelf itself I love that it draws your eye down, towards the stone work I so lovingly installed last fall. I also added some larger scale items on the hearth to unify the look. My neighbor gave me this old tin paint bucket (last fall I filled it with firewood and twinkle lights for my Christmas mantel) and this year I filled it with branches and gourds. I put my second silver owl down there as well. On the other side of the mantel shelf I put up a lantern (I actually picked it up this year for halloween) One pane of glass was broken, so I just removed ALL the glass and put it up on a black candlestick. I found some metallic pumpkins (from Hobby Lobby last fall) and thought they went well with the silver pieces. I also reused my dollar store leaf topiary that I made two years ago now. I still love it.. I should make more. I also decorated the shelves next to it.. with my faux locker baskets and wooden block pumpkins. I am SO READY for fall to begin.. and hopefully it will bring with it some showers that California desperately needs!